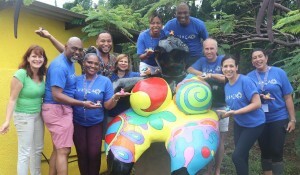 WILLEMSTAD - In the week of October 15th, Curaçao welcomed Association President & CEO’s of several key Caribbean destinations to strengthen our Caribbean ties and to showcase our tourism industry. For the first time in history, a Dutch Caribbean island was the host of the Caribbean Hotel & Tourism Association (CHTA) executive retreat. As the importance of tourism grows on our island, so does our commitment to the region who depends on this economic pillar. CSHAE (Caribbean Society of Hotel Association Executives) was set up by CHTA to encourage and facilitate networking and exchange of information among Association executives in the region and to strengthen links among national associations. It is therefore a support mechanism for AEs where new and less experienced AEs can benefit from lessons learned and experiences of other AEs. CSHAE convenes on an annual basis for a Leadership Conference focused on improving the management skills of Association Executives through training, dialogues and most importantly sharing of information. During the meetings of the CSHAE issues such as last year’s hurricane devastations and the role of CHTA in elevating the Caribbean as a region were addressed. Furthermore, executives of the CSHAE also took the time to elaborate on developments and views regarding the local tourism industry in each island. Per Stacy Cox (President of CSHAE) from Turks & Caicos, Curaçao has an immense potential but decisions must be made which include the actual implementation of the Tourism Master Plan, adequate funding and most importantly the restructuring of the CTDF in a true public and private entity which is responsible for the management of the destination. According to President & CEO of CHATA, Miles Mercera – The Caribbean hospitality industry is operating in an increasingly dynamic and competitive environment in which issues confronting the industry are expanding in range and complexity. These issues are therefore sometimes better dealt with as a region. The Caribbean is competing against the world and we must continue to foster and stimulate combined efforts on areas such as Airlift, Marketing, Human Resource Development and Training. I believe in coming together to further strengthen our #OneCaribbeanfamily brand that will benefit us all. As part of the retreat in Curaçao, the delegates enjoyed a full program which includes a walking dinner in Pietermaai a breakfast meeting with CHATA membership hosted by MCB, a full day of internal meetings hosted by ACOYA, a communication workshop hosted by Serena Art Factory, A Caribbean dinner hosted by the Curacao Culinary Team and the Renaissance Curaçao, Sunset Boat trip in Spaanse Water by At Sea Curacao, Tambu and Pan Sera workshops and much more. The retreat was hosted by Livingstone Janthiel Resort, Papagayo Curaçao and Morena Resort. Special thanks to Luxury Taxi Services and Scooby Tours who took care of all their transportation needs.